John Black was born on 31 October, 1778, in Great Yarmouth, Norfolk, though he spent his childhood at Woodbridge in Suffolk, where his father, also called John, was curate at Butley from 1789 to 1813. This elder John was also chaplain to the Woodbridge House of Correction, headmaster of the Woodbridge Free School and chaplain at the army camp at Bromeswell . He was also a noted classical scholar and prolific author. What we know about the son’s life comes primarily from his letters to his father, which the latter published. It seems young John first went to sea in 1795, aged 17, in the “Walpole”—a good Norfolk name for a trading vessel and East Indiaman. However, his real adventures began in May, 1797, when he arrived in Torbay and signed on as purser and navigator of the “Lady Shore”, bound for Sydney, Australia. The “Lady Shore” was carrying soldiers as reinforcements for the New South Wales Corps. They guarded the convicts, which was neither a pleasant nor a high status role in the army of the time. The ship also carried food and farming equipment, both sorely needed by the poorly-equipped prison colony. It also had aboard 69 female convicts, one male army prisoner, some wives and children of the crew and one passenger and his wife. After eight weeks at sea, off the coast of Brazil, the long-threatened mutiny finally broke out. The soldiers, led by the French prisoners-of-war and joined by some of the sailors, the ship’s surgeon (under duress) and 66 of the female convicts, seized the ship, killing the captain and first mate. Black described what happened next. After being confined below decks for two weeks, Black with the those of the ship’s crew who would not join the mutiny, the army convict, the passenger and his wife, four other wives, four children and three female convicts, were put in a longboat and set adrift. The twenty-nine men, women and children aboard were allowed a little water and some basic provisions. For navigation, they were given a pocket compass and a quadrant. The nearest land was some 300 miles distant. Cast adrift, Black and his fellows could only watch as the “Lady Shore” sailed away under command of the mutineers. Then the castaways hoisted sail and headed as best they could for the Portuguese coast of South America. It was to be no easy journey. At last, having survived more heavy seas and driving rain, they were spotted by a local boat and helped to find their way to land at the harbour at St. Pedro, now Rio Grande, in the Brazilian province of Rio Grande do Sul. They had been only two days in the boat. Black thought it a miracle and the local people could scarcely believe their tale. 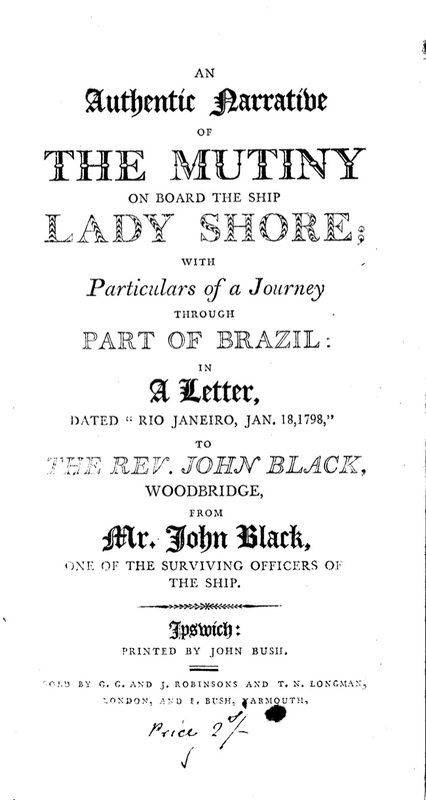 John Black and his companions were received kindly by the local Portuguese authorities, who promised them passage to Rio de Janeiro, where they might find a British ship to take them home. However, as delays mounted, some of their remaining goods were stolen and Black became increasingly impatient of the long wait for a ship. He therefore decided to make his own way overland to a port where he might take ship for Rio. He was accompanied only by Major Semple, the former army prisoner from the “Lady Shore”. The generous Portuguese provided a baggage horse, two guides and even two servants for the pair. The 480 mile journey to Santa Caterina thus became something of a triumphal progress, thanks to the enthusiasm of the natives, who proved feasts along the way and safe places to rest. When they reached Santa Caterina Island, they found some ships of the Portuguese navy to take them on to Rio de Janeiro. The whole journey had taken some six weeks. John Black was now safe, but he once again became bored by delays in Rio. The next fleet sailing for Britain would take time to arrange, then the long sea journey would add still more delays—perhaps eight months in all. So Black joined the crew of the “Indispensable”, a 14-gun privateer, which was sailing towards South Africa hoping to seize some Spanish booty along the way. The fate of the mutineers and the ship “Lady Shore” was not nearly so benign. The ship reached Montevideo in Uruguay, where it and its cargo were seized and sold by the Spanish authorities for 40,000 dollars. The male mutineers were simply thrown into jail. Nothing was heard of any of them after. From the women, those “judged pretty enough” were shared out as servants amongst certain favoured Spanish families in Montevideo, doubtless to the pleasurable anticipation of their new masters. The plainer women then joined the men in jail. What happened next to either group, plain or pretty, is equally unknown. It was unlikely to have been good. As for John Black, his adventures were far from over, as we will see in the second instalment of his story. This entry was posted in Crime, Travel. Bookmark the permalink. Oh what happened next to John Black? Please I hope you can tell us more. There’s a second instalment coming?